I was skeptical when I first got the V10 CPU Cooler. But man this is an awesome piece of hardware. Read the review to find out why. I have seen a lot of CPU coolers in my career. Some of them work; some of them don't. That's how my approach was towards the V10. I thought it's probably a CPU cooler that will be somewhat better then the stock CPU cooler. A few degrees difference and that's it. 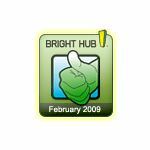 But wow, this piece of premium hardware blew me away. 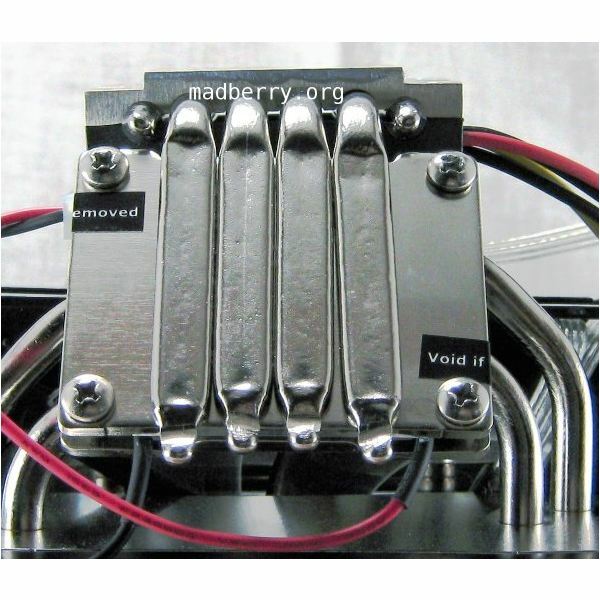 This V10 CPU cooler was tested in a “real world" environment. This means that I took one of my boxes (specs here, the desktop) took the stock cooler off and replaced it with the V10 CPU cooler. This box is mostly used for home computing: We watch TV and IPTV on it. We game on it. Before replacing the stock cooling I generated a log of the temperatures with the stock fan. This was also done after replacing the it with the V10 CPU cooler. These two logs where then compared to come up with the data used for this review. Temperatures where taken with the box in idle state and and with full CPU usage. After taking the V10 CPU cooler out I had a water cooling system to review so I took some preliminary data to compare V10 data against it. In a separate article still to be written (the link will appear here after it's done) I will describe the IR thermometers and other equipement used to get to the results measured. Please watch for this article next month. As said above I measured the temperatures under load and in idle state. 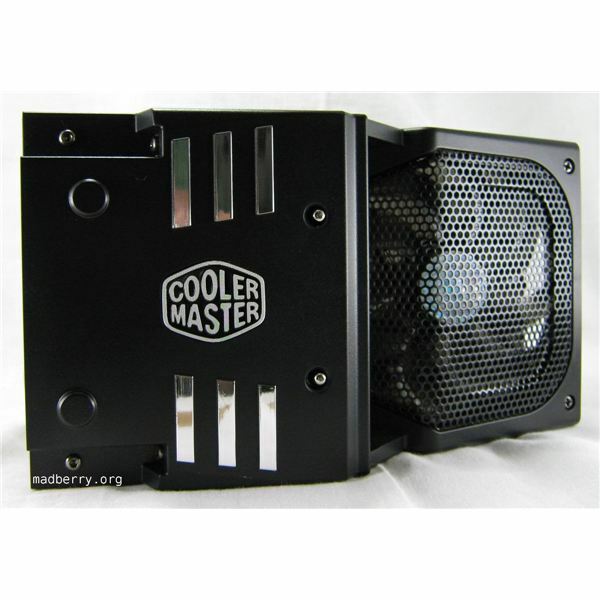 I must say the airflow in this Cooler Master Cosmos case is excellent so the temperatures are really low already. Here is the average of the temperatures. 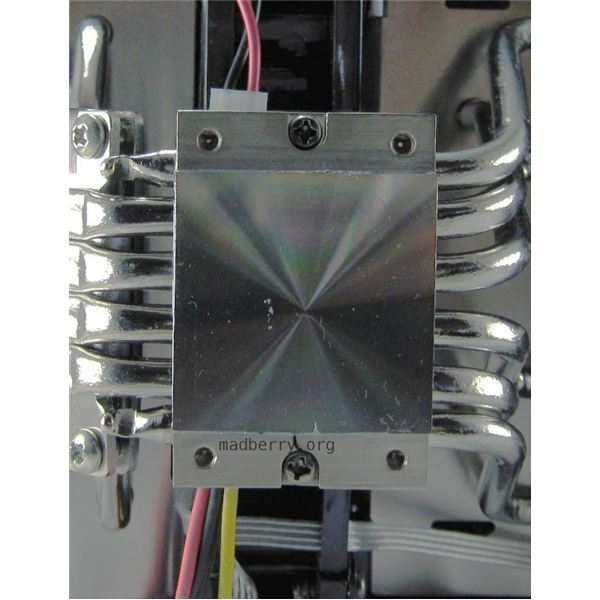 The V10 CPU cooler is so great because it has a TEC (Thermal Electric Cooler), also called a Peltier element. 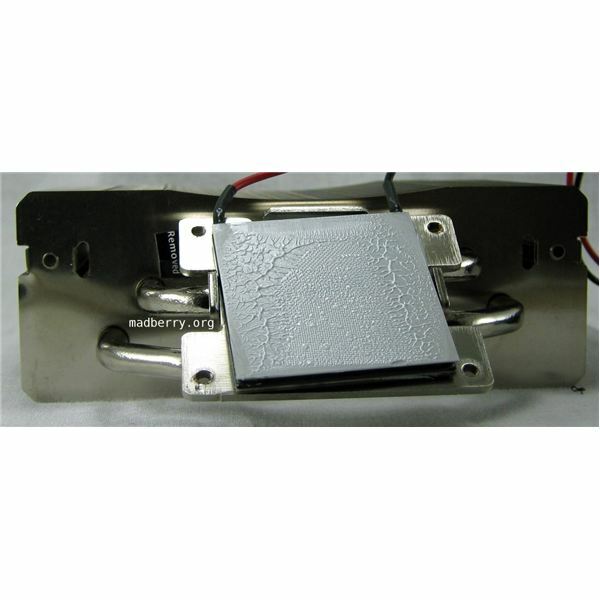 A Peltier element has a hot and a cold side, and uses thermoelectric properties to move heat from the hot to the cold side. It is pretty cool tech, if you will pardon the pun, but rather complicated to anyone without a background in physics or, more specifically, electical engineering. If you are up for it, there is a lengthy and technical, but good, explanation of Peltier cooling here. 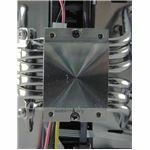 The cold side of the element is connected to six heat pipes that connect to the CPU base, which has a special nickel coating with a copper core. Four more heat pipes are dedicated to directing the heat of the back (hot side) of the Peltier element away. Thats a total of ten heatpipes for the appropriately named V10, six cooling the CPU, and four moving heat away from the cooler towards the case's airflow. As one would expect from this, the V10 CPU cooler is huge. Make sure you look at the dimensions before deciding to buy it. 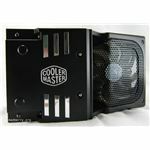 For full specs see the Cooler Master website. Installation was relatively easy: the V10 CPU cooler came with CM's new Thermalfusion 400. It's a thermal non-curing compound that also acts as a glue. Spread the Thermal paste evenly over the CPU. Attach the right hardware for your CPU to the V10 and attach the V10 to your motherboard. You will have to take your motherboard out of the case to do this. If you have to take the V10 CPU cooler of your CPU be careful or you will pull the CPU out of the socket. Use a twisting motion (after the screws are out, obviously) turning clock and counter-clock wise sligtly, to pull it off. 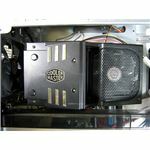 Don't rock the cooler, it shoud stay perpendicular to the motherboard until you have turned enough to loosen the adhesive and pull the cooler straigh up. Rocking the cooler or pulling it off at an angle could do untold damage to your chip or motherboard. That isn't particular to this cooler, any cooler where the thermal compound has cured, even where it isn't supposed to be adhesive, will make the CPU want to stick to it. 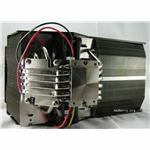 The biggest knock against Peltier or TEC cooling is power consumption. This piece of hardware takes up 70W all to itself through the attached molex connector, as much as a low-end graphics card. Make sure your power supply will cover the V10 along with all the other hardware in your box. The V10 CPU Cooler cools my box in any situation. With a full 100% CPU load (running folding, videos, and other apps) when testing under load, or at idle, the V10 cools my CPU 6 degrees Celsius lower then the stock cooler. Measurements with my hand held IR thermometers concur. 6 degrees lower than the stock cooler. 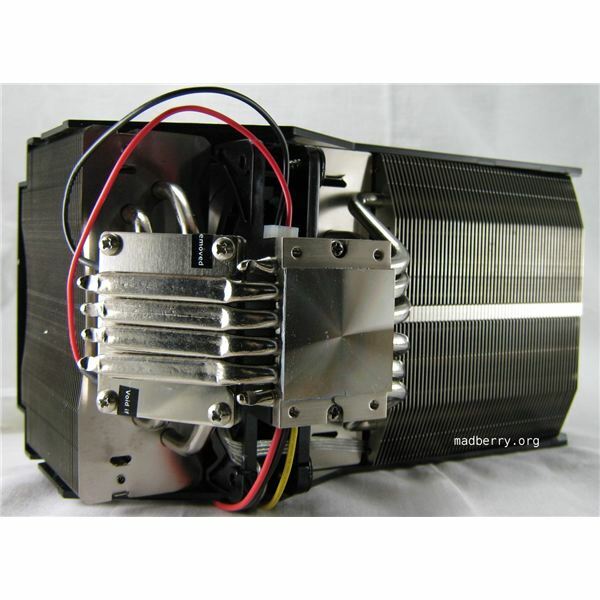 More impressive, the V10's Peltier Element can cool a CPU to below the ambient temperature. Wait what am I saying here? 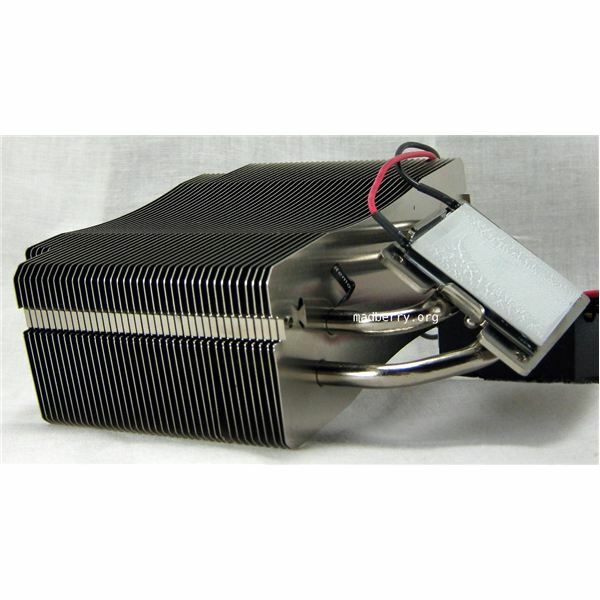 A stock CPU cooler uses the ambient air to cool the CPU. It other words it just moves the air, it can't lower the temperature below that of the air in the room. The V10 with TEC actually lowers the temperature. At the moment I am testing water cooling systems for a future article. The V10 CPU cooler out performs all of them. 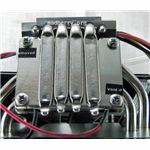 A water cooling system attempts to lower the temperature by running water over a CPU block. Then it runs the water through a radiator which lowers the temperature. I was amazed when I saw the results. I did additional tests which all turn out the same averages. The fans are rpm controlled. But even at full load the fans where barely noticeable. Of course this might also be because of the excellent isolation of the Cosmos case. 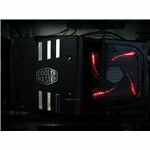 At Amazon the V10 is going for $125.33; at Newegg $139.99, of course this is while writing this article (Feb 20). 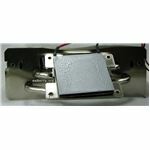 That may sound expensive by air cooler standards, but offers amazing value and performance, as well and much easier installation, compared to water cooling systems with prices starting at $200. 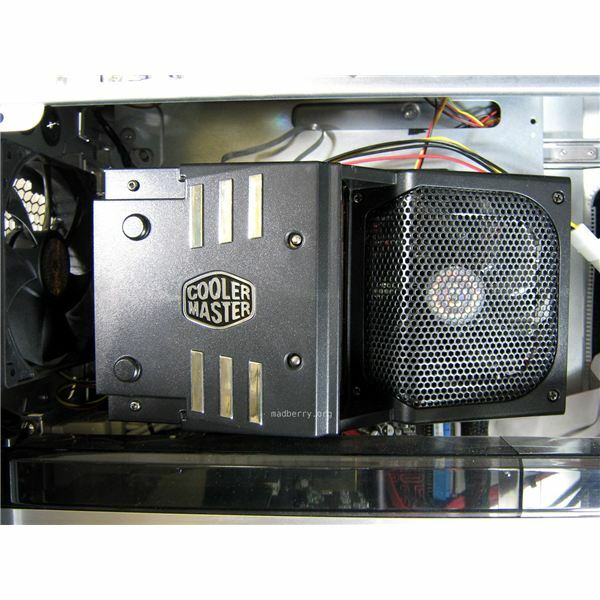 With these results Cooler Master won the award of “Best Cooling Product Feb 2009" in the category “Active CPU Coolers". Two thumbs up for Cooler Master.